Do you know if all your backlinks are active and indexed in Google? Do you know whether they are dofollow or nofollow? Do you know what anchor text they use? Well, that's exactly what 'Backlinks Manager' helps you find out, without any work required from you. With 'Backlinks Manager', all you need to do is to add your backlinks, and the system will add them to a user-friendly table where you will be able to see the date you added the link, the URL, the anchor text, the Moz Rank, Domain Authority and Page Authority, the numbers of inbound and outbound links, the number of social signals, whether it's a dofollow or nofollow link, whether it's indexed in Google or not, whether it's active or not found and the location of the link (country). All of this information is automatically updated. Imagine doing this yourself, in an Excel spreadsheet... It would take you hours of boring work to just create the spreadsheet, and then at least 1 hour per week to update it. 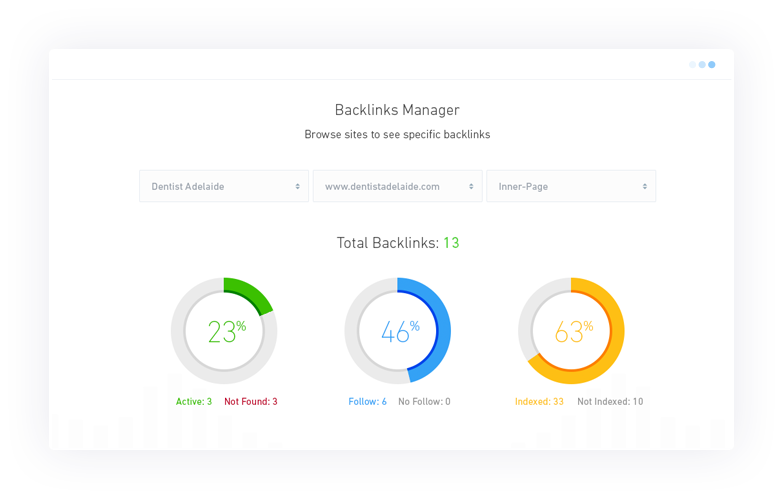 'Backlinks Manager' will save you hours of boring work every month.